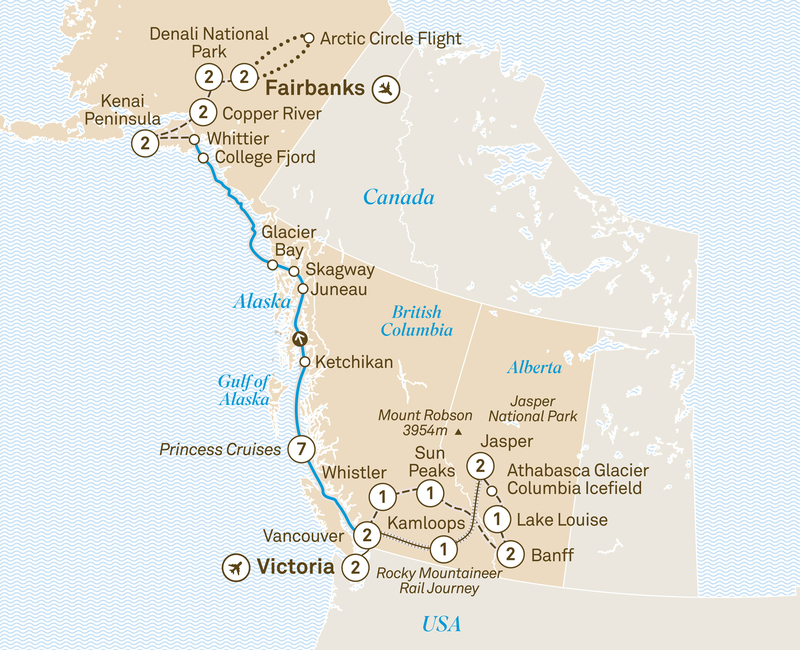 From Victoria to Fairbanks, this 28-day tour uncovers the sights of Canada. Visit beautiful Banff, Lake Louise, Kenai Peninsula and Denali National Park. There are some places on the fringes of this world more beautiful than you can imagine, but they’re sometimes so far off the beaten path that you won’t find them in the holiday photos of family or friends. Welcome to Alaska. Those in the know say that the Wrangell-St. Elias National Park is the true natural treasure of Alaska. Likewise, the locals’ playground, Kenai Peninsula, is slightly off the main tourist arteries, as is beautiful Copper River. This adventurous itinerary will let you prise open the hidden gems of this region, with its wondrous landscapes and its wealth of wildlife, and still ensure you do the essentials, such as cross the Arctic Circle, and visit Canada’s must-sees – the glorious Rockies, Whistler, Vancouver, and more. Your wondrous journey begins with an exclusive two night Special Stay at the Fairmont Empress. Tonight, celebrate with a welcome dinner. Visit beautiful Butchart Gardens, once a limestone quarry, now a delightful floral kaleidoscope. This afternoon, be as active or relaxed as you please. Today, take a tour through Vancouver, one of the world’s most liveable cities. Enjoy an overnight stay at the exclusive Fairmont Hotel Vancouver. Listen for the delightful bird calls complementing the water gushing over Shannon Falls. Learn about black bears during an exclusive presentation by expert researcher Michael Allen. Enjoy a choice of restaurants. Discover Canada’s history during an exclusive presentation by a voyageur at your hotel. Sleep at the Sun Peaks Grand Hotel in the quaint village of Sun Peaks. Fine or more casual dining are among your options tonight. You’ll feel like royalty during your two night Special Stay in your mountain or valley view room at the Fairmont Banff Springs. Be as active or leisurely as you like – it’s entirely up to you. Travel to Lake Louise and check into your lakeview room for an overnight Special Stay at Fairmont Chateau Lake Louise. Today, you’ll meet a Canadian Mountie, one of the land’s great cultural icons, wearing the famous red serge. Choose from a range of restaurants at your hotel for dinner. Take an ‘Ice Explorer’ on the Athabasca Glacier. Check into the rustic style Fairmont Jasper Park Lodge for the next two nights. Enjoy a selection of restaurants at your hotel. Jasper is an outdoor adventure playground. It’s a day you’re sure to enjoy, however you choose to spend it. The Rocky Mountaineer is one of the most iconic rail journeys in the world. You’ll enjoy two days of romantic rail travel with incredible GoldLeaf Service. Overnight, stay at a Kamloops hotel. Arrive in Vancouver for your overnight stay at the centrally located and exclusive Fairmont Hotel Vancouver. Join your Tour Director on a luxurious seven night Alaskan voyage on board Royal PrincessSM. Settle into your verandah stateroom and each evening, unwind after the day’s adventures with included drinks with dinner. Enjoy your ‘Welcome to the Seas’ lunch. Alaska’s first city is now known as the ‘salmon capital of the world’. Alaska’s state capital is only accessible by air or sea. Stroll through historic Skagway, with its shop facades and wooden boardwalks reminiscent of the gold rush era. Marvel as dramatic ice walls of Glacier Bay National Park and Preserve drift by you. This awe-inspiring bay is home to the world’s largest concentration of actively calving tidewater glaciers. Some of the glaciers of College Fjord are 40 storeys high and tower above even the largest cruise ship. Celebrate the end of your cruise with a toast at your farewell reception. Visit Alaska’s Wildlife Conservation Centre and encounter unique wildlife, such as musk ox and lynx. Tonight, begin your two night Special Stay at Kenai Princess Wilderness Lodge. Kenai Peninsula is a favourite playground for locals, so today enjoy the adventure and explore. View the Matanuska Glacier, approximately 42 kilometres long and 6.5 kilometres wide at its terminus. Later, feast on a quintessentially Alaskan salmon dinner at Copper River Princess Wilderness Lodge, where you’ll stay for the next two nights. A Park Ranger will take you on an exclusive journey into the immense Wrangell-St. Elias National Park. McKinley Chalet Resort is your Special Stay for the next two nights. Choose your own activity to make your day in this pristine wilderness truly unforgettable. Cruise a Sternwheeler and learn about other facets of Alaska, from huskies to Athabascan village life. Tonight begin a two night stay at Fairbanks Princess Riverside Lodge. Cross the Arctic Circle by plane and receive a certificate to prove it. It’s a once-in-a-lifetime moment. Soar over the rugged and magnificent Brooks Mountain range and wonder at the story of the vast, remote land below. Today, we bid a fond farewell. Thanks for joining us on a wondrous journey.